“Everyone has moments in their life where they will always remember exactly where they were when a certain event happened. I can remember exactly where I was at on September 11th 2001, the exact spot that I proposed to my wife and what I was wearing when my daughter was born (I still have that shirt by the way). I’ll also never forget exactly where I sat when my younger brother, Billy graduated from college. Even in an auditorium that seats thousands I can literally still take you to the exact seat where I watched it all happen. I remember it so well because it later became one of the most pivotal parts of my life that would “drive me” for years to come. It was one of those moments that seemed to come out of nowhere. I hadn’t been thinking about “it” at all leading up to his graduation, but once it entered my mind I knew it would never leave. As I sat and listened to all of the speeches and all of the ceremony that goes along with such an occasion, I started to feel uncomfortable. I could feel my face turning red and emotions that I never knew existed began swirling all throughout my head. My wife, who knows me better than anyone, could tell something was wrong. She leaned over to me and whispered in my ear “this is eating you up isn’t it”. I looked back at her with my eyes glossy, trying to hold back the tears and simply said “Yeah…it is”. It was one of those moments that two conflicting emotions were both fighting to stay on top. I was both extremely happy for my brother’s accomplishment, yet extremely disappointed in myself that I had not achieved getting my own college degree. I had the same shot as he did, right after high school but, due to my own choices, I didn’t take the opportunity seriously and found myself dropping out just 2 years into college. After leaving school I did what most people do, I worked, eventually got married, you know…life. There were times along the way that I’d feel regret over not finishing school but would quickly dismiss those feelings and come to grips in my own mind that it just wasn’t meant for me to be a college graduate. But something was different while I was watching my brother walk across the stage. I felt that little voice inside of me telling me “You can do this”, “If you want that degree you can have it”. I can’t explain what happened but I felt in my spirit that God was giving me permission to go after it again. When I got home that evening I couldn’t get on my laptop fast enough. I searched through every local college website I could find. Before the night was over I had enough information to get me started and I was determined to go back and get my degree. Over the next six years I would embark on this journey, and what a journey it was. I would get started taking classes and then my daughter was born. I wanted to make sure I was there for those “first moments” of her life so I had to take a couple of months off. I got started again and then had to have emergency back surgery, which resulted in another 6 months off. I finally got back into the swing of things and back in school and had the opportunity to move to Dallas. It was a great opportunity but cost me another 3 months off. It seemed that every time I’d start to build a momentum, something else would occur. I’ve taken classes in large auditoriums and temporary schoolrooms in side of churches. You name it…I’ve done it. At one point I was having difficulty in a particular subject and the Professor indicated that they only way he could help me is if I would be willing to come over to his house. Apparently, he had a eye condition that kept him from driving at night. I remember praying the whole way over there “Lord, please don’t let this man pull out a gun and lock me in his basement! !” Thank God that didn’t happen. I had a few moments during the process that made me want to quit altogether. One time in particular, I got halfway through my class only to realize that I had already taken it years before under a different name. Doesn’t sound like much but when you go to school from 6pm to 10pm at night for six weeks in a row, finding out it’s been all for nothing can be devastating. I remember Pastor Brady calling me after I realized what had happened. I was so depressed that I just wanted to quit it all. She said “Marc, all of your sacrifice and your labor of love in ministry for all of these years will not go in vain”….”God is going to reward you but you can’t get bitter about this”. I hung up the phone, dried my eyes and immediately started registering for the next class. I just kept my head down and worked as hard as I could moving on from the next class to the next, to the next. I’m convinced that life is all about small victories along the way. One day you’ll look up and all of your small achievements will result in one greater than you could imagine. 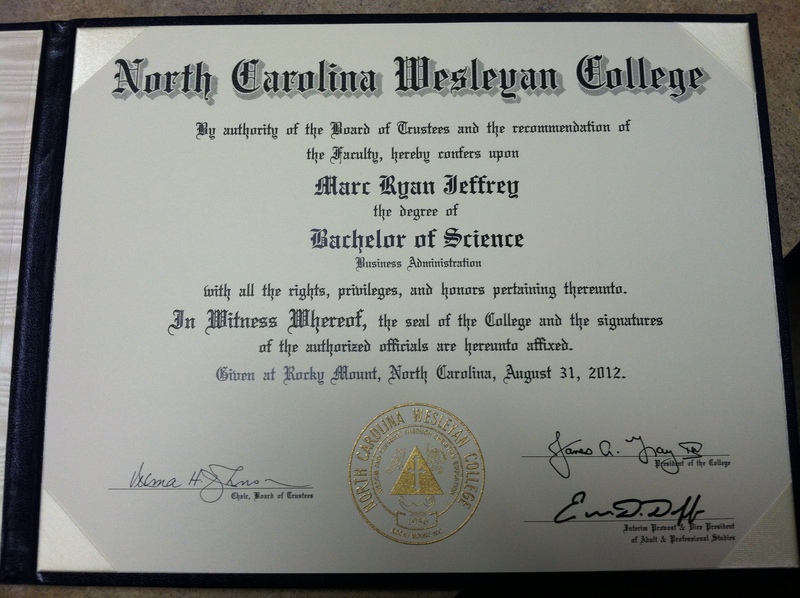 On October 9th, 2012 all of the hard work paid off and I received my college degree. I remember when it first arrived I just kept looking at it. All of the work, all of the sacrifice, all of the setbacks seemed to pale in comparison of what I was holding in my hand. I’m so grateful for that day that I attended my brother’s graduation. I’m grateful for God nudging me and challenging me to stretch myself. I’m grateful for a strong family support, such as my wife Lana who cheered me on and encouraged me at all the right moments. If you are going to try to reach any goal in your life you can’t let your initial view of it cause you to shrink back because of fear. The whole process from registering, getting transcripts, paying for it, as well as how long it would take to actually finish scared me to death! The old adage is so true, “How do you eat an elephant? One bite at a time”. Sometimes it’s just making that first call or sending that initial email that starts you on the right path. Don’t let the journey intimidate you. I can’t tell you how humbling it is to go back to school as an adult. If you have any arrogance in you, adult college education will quickly take that away. As I’ve stated earlier, I’ve attended class in high-rise buildings and small Sunday school rooms at a Lutheran Church. In each of those places I found the favor of God assisting me to get to where I needed to go. They weren’t always the most ideal of situations as I had planned in my head but they were effective. Being effective wins every time!